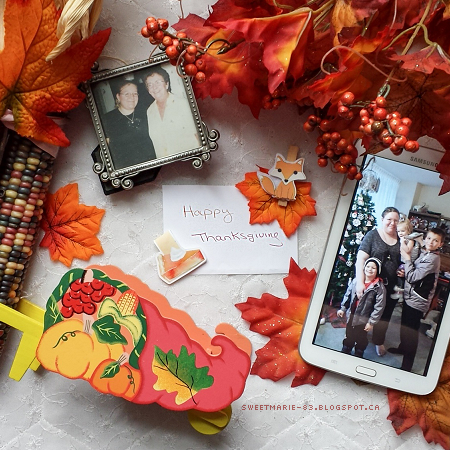 It’s Thanksgiving weekend here in Canada, so I thought it was the perfect time to talk about some of the things I’m grateful for, and why I think it’s important now more than ever to take pleasure in and be grateful for the little things in life. I’ve talked before about how the last two years have been difficult for my family and me, and I don’t think I need to go into details about the state of the world. Through all the crap that’s happened, though, I’ve learned to be even more grateful than ever for what I do have. Lately, I’ve seen many people online talking about feeling a lot of guilt over talking about simple or ‘frivolous’ things, or promoting their books/businesses/blogs while the world seemingly falls apart. I understand that guilt and feel it myself, but the sad truth is, there’s something happening almost daily anymore. It’s easy to get bogged down in the negative, scary things in the world, but we can’t stop living or loving. It’s important to acknowledge the things happening and to fight for change, spread awareness, and show sympathy, but it’s also important to at least try to continue living a somewhat normal life. To take pleasure where you can get it, find the light in all this darkness. There’s nothing wrong with needing an escape from reality and a break from the seemingly never-ending stream of bad news. It doesn’t mean you don’t care about the state of the world. Here are some of the things I’m grateful for this year, the things I’ve been using as an escape and taking pleasure in when the real world becomes too much. My mum is my best friend, and she’s the greatest friend anyone could ask for. She’s my sidekick, my confidante, and my favourite person in the world. I’m so blessed to get to spend so much time with her. I also spend a lot of time with my youngest nephew and niece, AKA The Littles. They’re with us most weekends, and we’re all about adventures, tea parties, movies, fun photo shoots, and much more. Every single week they teach me more about patience, unconditional love and understanding, and the importance of having an open mind and being flexible. My 4-year-old niece is a serious badass - strong, fierce, sassy, funny, imaginative, incredibly intelligent - and I’m fostering all of that in her as much as possible because it’s more important now than ever to raise girls to become strong women. Books have always been an escape and a constant companion for me. Currently romcoms are my jam, and I can’t get enough. A few of my recent favourites: the Castle Calder series by Brenda St John Brown, The Chateau of Happily Ever Afters by Jaimie Admans, Mister Hockey by Lia Riley, and Ten Days With the Highlander by Hayson Manning. I also love books set in my favourite places, especially London. A few of my recent favourites are London Belongs to Me by Jacquelyn Middleton, London Belongs to Us by Sarra Manning, and Act Like It by Lucy Parker. Besides my mum, my closest friend is Krista. We’ve been friends since first grade, and have been through so much together. We’ve drifted apart a few times over the years, but we always come back together, leading us both to believe we’re meant to be in each other’s lives. I’m grateful for our talks, ranging from philosophical to silly to all things nerdy/fandom-related and everything in between. I also have some wonderful online friends, who I’ve met through blogging, writing, Twitter, and most recently Bookstagram and Instagram. Speaking of Instagram, I’m also thankful for the creative outlet it provides; it challenges me to be more creative and up my photography game, and it brings me so much pleasure. The community, especially the bookish community is so warm, welcoming, and supportive. U2’s new song and music video (basically a love letter to NYC) You’re the Best Thing About Me. Taking up knitting again after many years away from it and starting by making a present for a friend. Rewatching Buffy the Vampire Slayer for the first time in years. No matter how bad things are, it’s important to find positive things, things to be happy about, things to celebrate. Continuing to live your life doesn’t make you a bad person and it doesn’t mean you don’t care about people’s suffering. Something else that’s important to remember: it’s not selfish to practice self-care or take social media breaks if it means maintaining your sanity. You don’t need to be ‘on’ all the time. Take pleasure where you can get it and be grateful for all the good things in your life and in the world. What are you grateful for this year? What small things have you taken pleasure in lately? Do you ever feel the guilt I mentioned? Beautiful post as usual, Marie. I completely agree with you. I recall seeing someone on Twitter ranting about how people still tweet out normal stuff or don't stop scheduled tweets when something bad happens. Well, if you're scheduling tweets maybe it's because you're not at the computer 24/7 and won't be able to stop it. Just a thought. And besides, what does tweeting a hashtag really do for those people in those tragic situations? Haha no worries I totally get it. Jessica schedules our Sunrise Author Service tweets days and even weeks in advance. I'd do it for my own Twitter if I were more organized, and I know plenty of people who scheduled their tweets for their books or blogs weeks in advance so they don't always have to be around or remember to do it. And a lot of times, people have no clue what's going on until later...I tend to be slightly ignorant of what's happening because I avoid it as much as possible for my own mental health.